Jeevan Rekha Hospital - Nursing Homes / Clinics / Hospitals of paralysis treatment service, brain hemorrhage treatment service & brain injury and spinal treatment service in Allahabad, Uttar Pradesh. A brain hemorrhage is a type of stroke. It's caused by an artery in thebrain bursting and causing localized bleeding in the surrounding tissues. This bleeding kills brain cells. The Greek root for blood is hemo. Hemorrhage literally means "bloodbursting forth." Brain hemorrhages are also called cerebral hemorrhages, intracranial hemorrhages, or intracerebral hemorrhages. They account for about 13% of strokes. What Happens During a Brain Hemorrhage? When blood from trauma irritates brain tissues, it causes swelling. This is known as cerebral edema. The pooled blood collects into a mass called a hematoma. These conditions increase pressure on nearby brain tissue, and that reduces vital blood flow and kills brain cells. Bleeding can occur inside the brain, between the brain and the membranes that cover it, between the layers of the brain's covering or between the skull and the covering of the brain. Traumatic brain injury is sudden physical damage to the brain. The damage can result from a closed head injury, such as that caused by impact of the head with an object like the windshield or the dashboard of a car. The damage can also result from a penetrating brain injury, such as that caused by a bullet piercing the skull. Approximately 200,000 people die each year in the US from brain injuries, with an additional 500,000 hospitalized for treatment. About 10% of surviving individuals have continuing disabilities that may impair their ability to live independently. Traumatic spinal cord injury is damage to the spinal cord that results in loss of mobility or feeling. In most cases, the spinal cord remains intact, but the damage results in loss of nerve function. The spinal cord is a dense bundle of nerves that lies in a narrow canal in the center of the vertebrae. The spinal cord carries all of the major nerve pathways that connect the brain to the rest of the body. Injuries to the neck or back may damage the spinal cord, causing loss of function of the nerves below the injury. In the US, approximately 8,000 new cases of spinal cord injury occur each year, and an estimated 450,000 people in the country live with the condition. Epilepsy is a neurological condition involving the brain that makes people more susceptible to having seizures. It is one of the most common disorders of the nervous system and affects people of all ages, races and ethnic background. Almost 3 million Americans live with epilepsy. When a person has two or more seizures, he or she is considered to have epilepsy. There are many possible causes of epilepsy, including tumors, strokes, and brain damage from illness or injury. In many cases, there may be no detectable cause for epilepsy. The pain from tension-type headaches have been described as "vise-like." Headache is a broad term that encompasses many different things.Headaches are pains that occur in any region of the head; they can occur on both sides the head or be isolated to a certain location. We will look at the causes of primary headaches and secondary headaches in turn. Primary headaches are stand-alone illnesses caused directly by the overactivity of, or problems with, structures in the head that are pain-sensitive. This includes the blood vessels, muscles and nerves of the head and neck. They may also result from changes in chemical activity in the brain. Primary headaches can occur when pain-sensitive structures in the head do not work properly. Brain fever refers to any condition that causes the brain or any part of the brain to become inflamed, causing fever as one of the symptoms. Conditions that are described as brain fever include meningitis and encephalitis. Meningitis is inflammation of the membranes that cover the brain and the spinal cord, while encephalitis is inflammation of the brain itself. Meningitis is a brain fever that affects the meninges, or the membranes that cover the brain and spinal cord, and it is caused by viral, bacterial or fungal infection. Viral infection is the most common cause of meningitis. Symptoms of meningitis include fever, headache and stiffness in the neck. Patients sometimes mistake meningitis symptoms for flu symptoms. All meningitis, whether viral, bacterial or fungal, is medically serious and requires prompt treatment by a doctor, but bacterial meningitis is the most dangerous of the three and constitutes a medical emergency. Brain inflammation, also known as encephalitis, is usually caused by an infection that is viral in nature. Encephalitis can sometimes go away on its own, but since it can be potentially serious, any person who is experiencing these symptoms should seek the care of a medical professional. Symptoms of encephalitis include fever, pain in the joints and fatigue. A severe infection can cause symptoms like seizures, changes in personality and localized paralysis. Diagnosis of this condition, whether meningitis or encephalitis, usually involves a series of tests. One diagnostic procedure common to both conditions is lumbar puncture or spinal tap, which involves the gathering of a sample of cerebrospinal fluid (CSF) for analysis. In the case of bacterial meningitis, lumbar puncture can sometimes help doctors discover which specific bacterium is responsible for the condition. Meningitis can also be diagnosed through analysis of blood or by x-ray or other means of imaging. Diagnosis of encephalitis can involve procedures like electroencephalography (EEG) or biopsy of the brain. Urgent surgery is typically only necessary if the patient experiences progressive weakness in the legs, or sudden loss of bowel or bladder control, which may be caused by cauda equina syndrome. In cases where the sciatica pain is due to a lumbar disc herniation, a microdiscectomy or small open surgery with magnification may be considered. In this surgery, only the portion of the herniated disc that is pinching the nerve is removed - the rest of the disc is left intact. This surgery is generally considered after 4 to 6 weeks if the severe pain is not relieved by non-surgical means. If the patient’s pain and disability is severe, surgery may be considered sooner than 4 to 6 weeks. As a general rule, approximately 90% to 95% of patients will experience relief from their sciatica pain after this type of surgery. Dementia is not a single disease in itself, but a general term to describe symptoms such as impairments to memory, communication and thinking. While the likelihood of having dementia increases with age, it is not a normal part of aging. Before we had today's understanding of specific disorders, "going senile" used to be a common phrase for dementia ("senility"), which misunderstood it as a standard part of getting old. Light cognitive impairments, by contrast, such as poorer short-term memory, can happen as a normal part of aging (we slowly start to lose brain cells as we age beyond our 20s3). This is known as age-related cognitive decline, not dementia, because it does not cause the person or the people around them any problems. Dementia describes two or more types of symptom that are severe enough to affect daily activities. Symptoms that are classed as "mild cognitive impairment" - which, unlike cognitive decline, are not a normal part of aging - do not qualify as dementia either, since these symptoms are not severe enough.For some people though, this milder disease leads to dementia later on. A number of brain disorders with more severe symptoms are classified as dementias, with Alzheimer's disease being the best known and most common. This proportion rises to about a third of people aged 85 and older. The non-profit organization says Alzheimer's accounts for between 60% and 80% of all cases of dementia, with vascular dementia caused by stroke being the second most common type. A stroke is occasionally treated with thrombolysis ("clot buster"), but usually with supportive care (speech and language therapy, physiotherapy and occupational therapy) in a "stroke unit" and secondary prevention with antiplatelet drugs (aspirin and often dipyridamole), blood pressure control, statins, and in selected patients with carotid endarterectomy and anticoagulation. Strokes can be classified into two major categories: ischemic and hemorrhagic. 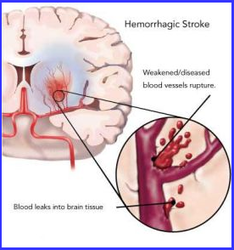 Ischemic strokes are those that are due to interruption of the blood supply, while hemorrhagic strokes are the ones which are due to rupture of a blood vessel or an abnormal vascular structure. 80% of strokes are due to ischemia; the remainder are due to hemorrhage. Some hemorrhages develop inside areas of ischemia ("hemorrhagic transformation"). It is unknown how many hemorrhages actually start off as ischemic stroke.